I had so much fun teaching the lovely Emma from The Candy Tree on Saturday. She had never worked with hot glass before and did a wonderful job! 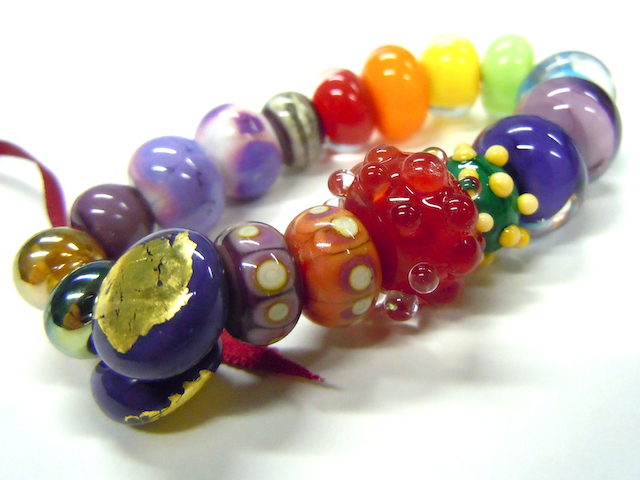 Here are some pictures of the beads she made (and a couple of buttons on top of that for fun). All of these were mastered in just four hours at the torch, she’s definitely a natural! If you are around Edinburgh and interested in learning some lampwork, I offer 4 hour or 8 hour lessons. Feel free to e-mail me for more information. I feel blog guilt. It’s been quite a while, but everything has been mad busy here, which is definitely a good thing! 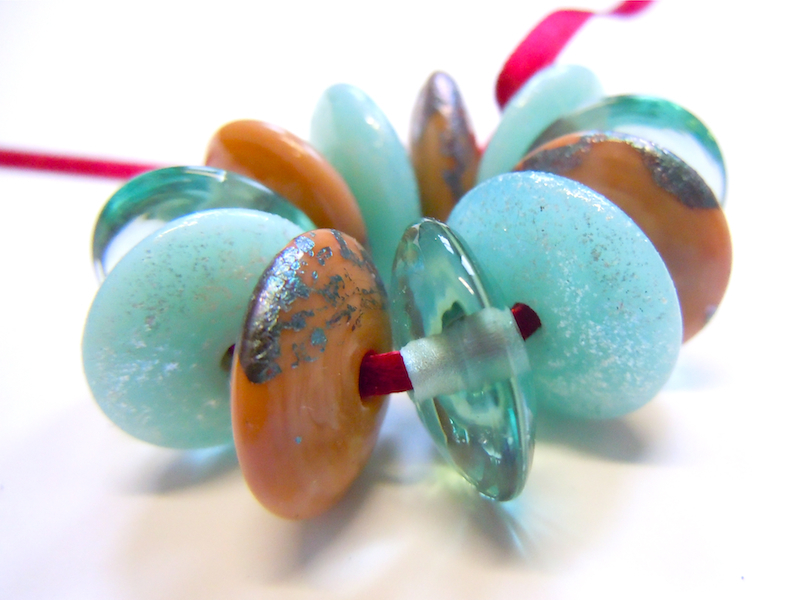 I taught a lovely lady some lampwork skills yesterday, have a couple of new galleries lined up for 2013 already, and my etsy shop is ticking along well. On top of all this, I’m working slowly but surely on some new ranges of jewellery and beads, and hope to share the inspiration and making process with you all. In the meantime, I have been working on some little, more affordable for January versions of some of my more popular beads, ranging from £12 to £14 for a set. I’ll leave you with some of them for now (links are clickable) and be back with some of my new work and ideas quicksmart! What a little neglected blog I have! The festival has been and gone, and I have to admit heaving a sigh of relief! The stall was crazy, really wonderful, and lovely to meet so many customers from all over the world, but my goodness, it was exhausting, and after 10 hours a day chit-chatting and selling away all I wanted to do was crash. But I’m back, and working on new projects, which is always when I feel most inspired to blog. The next up and coming exhibition is one I am really excited about! It goes back to the very very beginning of my jewellery designing journey in fact. A long time ago (well, four and a bit years ago) I was lucky enough to land a job in the Little Bead Shop in Bruntsfield with the lovely Gil and Emma Baird, and learned so much of what I know now from working there! Emma was the one who introduced me to lampwork, and look where that took me! Anyway, I digress. The Little Bead Shop has been moving with the times and has now gone beyond beads and grown into ACS Jewellery Studio with five fully equipped jewellery benches through the back, and a beautiful gallery space at the front. I’m going to be in the next exhibition they are holding, ‘Made in Scotland’, which features some very talented jewellery designers including some new Duncan of Jordanstone graduates, a handful of ACJ’ers, and the lovely Emma! I’m so excited to be back there! I’ll have to do a wee inspiration/sneak preview post of my work, but in the meantime, hold the date September 14th. Its going to be a fabulous opening night, and it would be wonderful to see you there! I have been working my little socks off the past few weeks, and will be for the next two months, because two months today I will be running a stall for two weeks selling my jewellery in the Edinburgh Fringe Festival! How exciting (and scary!! ), I have so much to do! Its only for a week (I couldn’t manage any longer), and its the first time I will be selling my jewellery to the public face to face… I have a few tricks up my sleeve to be revealed closer to the time, but I’m pretty nervous, and working in the studio all the hours I can. The stall will be on the Royal Mile, the Festival’s Hub of activity, right next to St. Giles Cathedral. Wish me luck!! I will keep you posted with my making process, once I get through a mountain of paperwork! 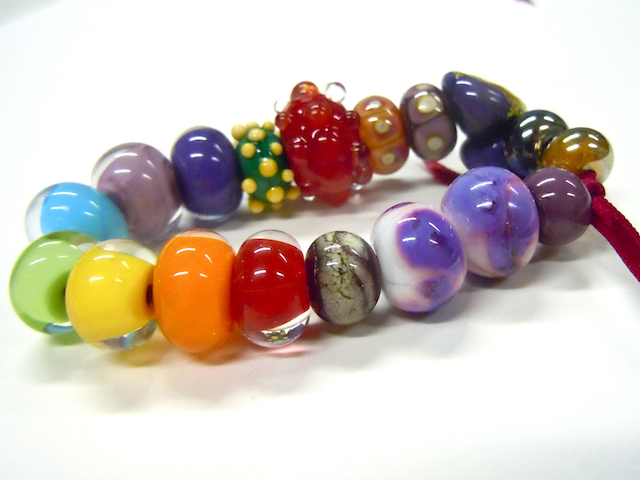 In other news, I have managed to make some new beads for my online shop! They are pictured here, and you can click the pictures to be linked to their listing. I thought I would share with you the work of my studio mate, Jessica Howarth. Jess and I met at art college and have been sharing a studio at Arts Complex in Meadowbank since September. 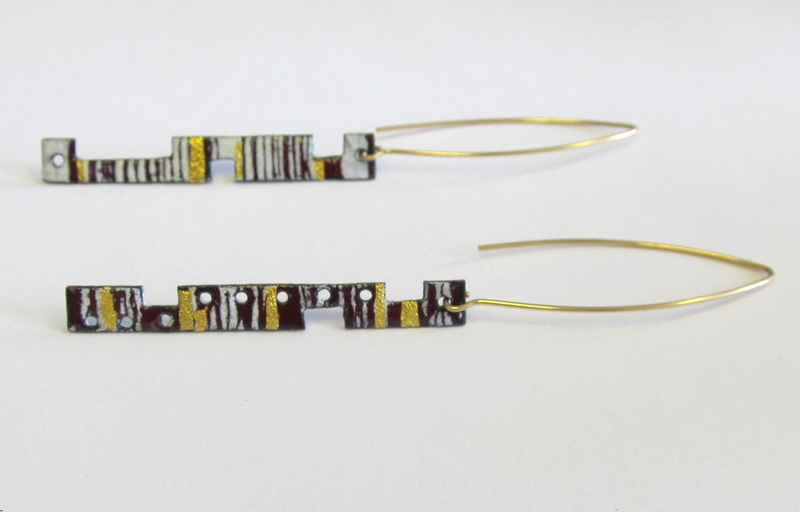 We both work with kilns, and both glass to an extent, only Jess works with enamel (very finely ground glass), and metal. 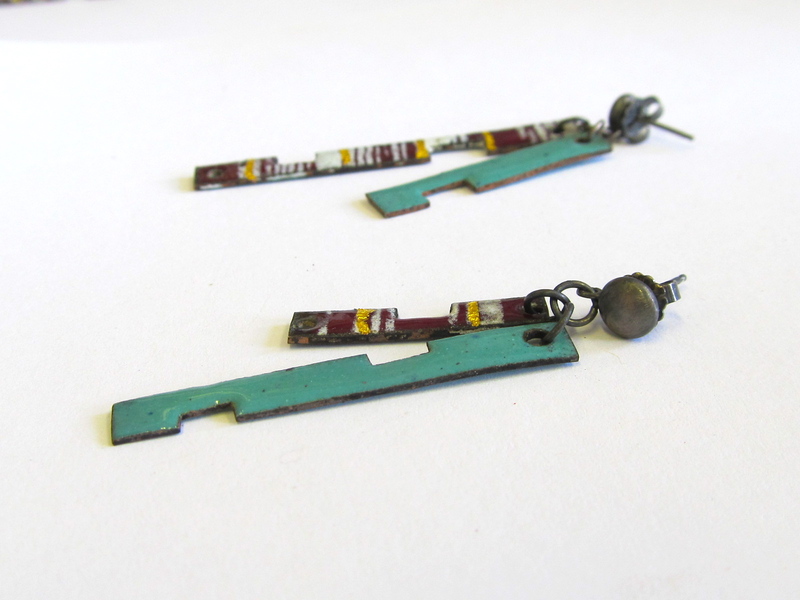 She gradually builds up layers of coloured enamel onto copper or silver, patiently fusing layer after layer onto the base in a kiln. 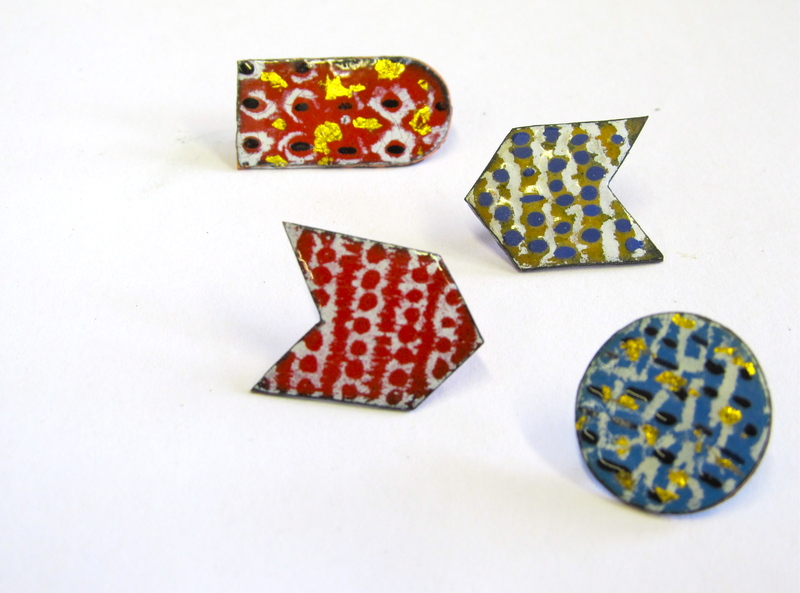 The ‘houses’ in the pictures are her degree show work, 3D Structures of enamelled copper, with various pieces of wearable jewellery hidden within. Here are some more images, enjoy! I’m really looking forward to this! One of my favourite artists of all time, Edvard Munch, is having an exhibition dedicated to his prints at the Scottish National Gallery of Modern Art, opening on Saturday. I’m dying to go, it looks wonderful. There are some rarely woodcut printed pieces, around 50 works on paper, most featuring his recurring themes of mortality, darkness, the female form and harrowing self portraits. I will definitely be heading along to see this when its on, if you are in Edinburgh I hope you do too.